Keeping your family fit and healthy is a challenge. It’s not that easy maintaining a healthy lifestyle all year round because people, especially kids, are drawn to processed and sugary foods. Anything that’s green and fresh is often considered unpalatable because of the influence of tempting food commercials. As a responsible family member, your job is to make sure that everyone at home gets the essential nutrients he or she needs to ward off sickness and diseases like flu, obesity, and diabetes. Providing healthy and nutritious snacks is an excellent strategy to promote health in your family. In this article, we’ve prepared a list of the best snack foods that are sure to delight everyone. These snacks guarantee that your family eats right without the dangers of processed carbs and sugar. Read on. Nothing is healthier in the morning than a bowl of oatmeal. Oatmeal is a wholegrain which is a healthy source of fiber that lowers bad cholesterol (LDL). If you find oatmeal a bland choice for snacks, mix it with sliced bananas, chopped walnuts, and a teaspoon of ground cinnamon. Bananas help lower your risk for developing asthma and are a good source of vitamin C. Walnuts support brain health by improving cognitive function. Lastly, ground cinnamon contains anti-inflammatory properties that relieve allergies. Do your kids hate apples? Apples are extremely beneficial since they’re rich in polyphenols, plant chemicals that work as antioxidants to fight off free radicals in the body. Polyphenols offer protection from heart disease and certain cancers. To make apples super tasty, the trick is to add a spread of organic peanut butter on each slice. This isn’t only a yummy snack treat, but also provides added protein and potassium. Here’s an easy to make, delicious snack that’ll satisfy your family’s mid-morning or afternoon cravings: Strawberry almond smoothie. Consuming smoothies is a creative way to incorporate fruits into your daily diet. Adults and kids love smoothies since they’re cold and creamy. 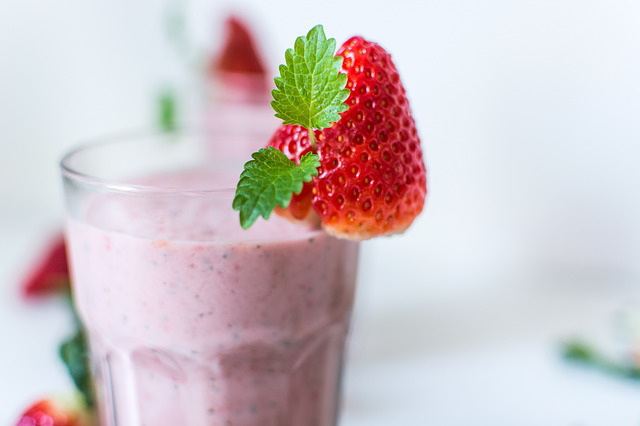 To prepare strawberry almond smoothie, simply blend strawberries, almond milk, sugar, and tofu. You can use Splenda as a sugar substitute. Adjust your sweetness preference. Strawberries and almond milk promote a healthier brain and nervous system while tofu provides all eight essential amino acids. If anyone in your family is a sweet tooth, he or she will absolutely love frozen yogurt blueberry bites. These deliciously sweet and sour treats can be the best substitute for any unhealthy dessert. Loaded with calcium, antioxidants, and fiber, you can pop as many as you want in your mouth without the guilt of gaining weight. You only need 10 minutes to prepare these frozen yogurt blueberry bites. Line a baking sheet with parchment paper. Prepare a bowl of blueberries and a bowl of Greek yogurt. Poke each blueberry with a toothpick and dip it into the Greek yogurt. Place each dipped blueberry on the sheet. Once you’re done, freeze the dipped blueberries for about an hour. Kids love calling this snack treat Ants on a Log. Adding a spread of peanut butter and raisin on a celery stick is a great way to have fun with this versatile vegetable. Because celery contains vitamins such as A, C, E, and B6, it lowers cholesterol levels, promotes healthy joints, and calms the nerves. The addition of peanut butter and raisins add taste to the celery and provides your family with protein, potassium, and iron. An effective way to help family members gain healthy eating practices is to provide them with nutritious and delicious snack foods. Snacking for children and adults is an important element of a healthy lifestyle. You can be as creative as you want when preparing snack treats. Don’t be afraid to mix and match fruits, vegetables, and whole grains. Did you know that Trust for America’s Health estimates that by the year 2030, 44% of Americans will likely be obese? Also, the Center for Disease Control and Prevention expects that 42% of Americans will have Body Mass Index levels indicating they are overweight. Further, given that 42% to 63% of overweight high school kids are likely to be obese as adults, as a concerned parent, you would want to learn how to prevent obesity in your kids. Childhood is the perfect time to inculcate healthy eating and exercise habits so that they can avoid obesity and the common medical issues that accompany it into adulthood. To raise healthy kids and potentially fit adults, you must first understand the root causes of obesity. Accordingly, you can work out how to prevent the condition in your family. Results of a study established in the International Journal of Preventive Medicine reveal that kids are most likely to be overweight because of various issues that range from genetic propensity and unhealthy habits to environmental factors. Genetic Factors: Your kids’ individual genetic makeup and the traits they inherit from their parents can affect their propensity to gain weight. They may also inherently have a slower metabolism that results in their body storing fat instead of expending it to get energy. How the body stores fat is yet another factor that genes control. Unhealthy Eating Habits: While genes do play a significant role, your kids’ diet can also affect their weight. Too many sugary foods and beverages and other high-energy items can cause weight gain when kids are consuming more calories than they burn with physical activity. Lack of Adequate Playtime: If your children are spending too much time in front of the television or with other devices like tablets and computers, they could start to gain weight. Eating unhealthy snacks in front of the television and the influence of advertisements that encourage the consumption of sugary foods can also add to the problem. Environment at Home: The typical meals that you cook and serve at home are the first lessons you can give your child on how to prevent obesity. If you regularly exercise and watch what you eat, your child will also pick up the same habits. Accessibility to Parks and Playgrounds: If your neighborhood or community does not have any parks where your kids can play, they may be forced to spend time indoors and consequently, gain weight. Interestingly, you can start caring for your kids’ health even before they are born. Studies have shown that maintaining an optimum weight all through your adult years ensures that you have fitter children. You must also gain only the prescribed weight during your pregnancy and keep a careful watch on your diet and exercise regimens. The precautions you take will help you avoid gestational diabetes and prevent the possibility of diabetes in your kids when they become adults. Work with your doctor and request for a diet program that will help you keep your weight down. Also, ask about any other information on how to prevent obesity. Here are some ideas on how to prevent obesity in your kids. Keep them in mind when planning their meals. Watch Their Diet: Restrict the amount of sugary and high-energy foods that they consume and substitute them with low-fat dairy products, fruits, vegetables, nuts, and healthy fats and carbohydrates. Make sure they get adequate protein in their diet. Watch the Portion Sizes: Serve appropriate portions, but don’t allow overeating. Have Fixed Family Mealtimes: Get the whole family to be present at dinner. This time is great for bonding with the kids and encouraging healthy eating habits. Keep Them Hydrated: Encourage them to drink lots of water and restrict a number of sugary beverages they consume. Encourage the Right Kind of Snacking: Growing kids get hungry all the time so keep healthy snacks handy like fruit and salads with tasty dips like hummus. Restrict the Time They Spend with Devices: Restrict the time they spend playing video games and watching television. When working out strategies on how to prevent obesity, include encouraging them to play outdoor games and stay active. Help Them Stay Active: Take them to parks and playgrounds, so they play. You could also encourage them to take part in sports. This approach will need you to make the extra effort and drive them to and from practice, but your kids’ health will thank you for it. Join Them: Nothing excites kids more than their parents joining them in games and some rough and tumble. Use this fun time to create closer bonds with your kids. The habits you teach your children on how to prevent obesity will help them remain fit and healthy all through their lives. They are likely to continue to follow the lessons even when they are eating in the school cafeteria or out with friends. If, despite your best efforts, you still think your kids are gaining more weight than they should, consult your pediatrician for directions on how to help them. Under the supervision of your kids’ medical care practitioner, you could consult an expert dietitian for tips on how to prevent obesity in your children. And, create the perfect diet plan that is optimum for the whole family. Such fitness experts will take into consideration your kids’ likes, dislikes, and their lifestyles. They can also prescribe the right exercise regimens that will help your children attain their optimum weight levels and maintain them all through adulthood. The steps you take today will ensure the lifelong health of your children.